ABOUT: Okay, folks. Seriously, this is the most AMAZING organization I have ever come across. The extent of this organization is astounding! EntreAmigos means “Between Friends.” I am so energized and excited about this particular charity. I highly recommend that you browse through their website and take a look at their pages. I guarantee that you will instantly fall in love with EntreAmigos! If you are looking for a volunteer opportunity while on vacation in Puerto Vallarta, by rental car San Pancho is an easy 40/45-minute drive north of the PVR airport in Puerto Vallarta, Mexico. The EntreAmigos Centro Comunitario Educativo is a 16,000 square foot educational facility located on Avenida Tercer Mundo, a few hundred meters after entering into San Pancho. Their busy community center hosts the library, computer lab, classrooms, sports and exercise spaces, a gallery, a giant “fridge” cinema room, eco-design workshops, recycling center and re-sale shop! The building itself is fun, beautiful and educational. Please join them for a class, workshop, concert or lecture or just stop in and take a look around. THE FACILITY: In early 2009, EntreAmigos was given the rights to occupy and remodel an abandoned building along the main street. The giant building was originally a milk processing plant that had been sitting empty since the 1970s. With support and guidance from local sustainable designers and architects, 4 full time laborers and 100′s of volunteers, Entreamigos remodeled the first phase of the facility in six months. The focus was to respect as much as possible the original structure, re-use 100% of any waste created in the process and require that at least 80% of all new construction utilize recycled materials. Children, adults, artists and community members participated in every aspect of the process. EntreAmigos building has been recognized as a model facility for environmentally responsible design, the integration of natural elements and innovation in the use of recycled materials. EntreAmigos is truly a wonder of sustainable design and a great place to visit for everyone! 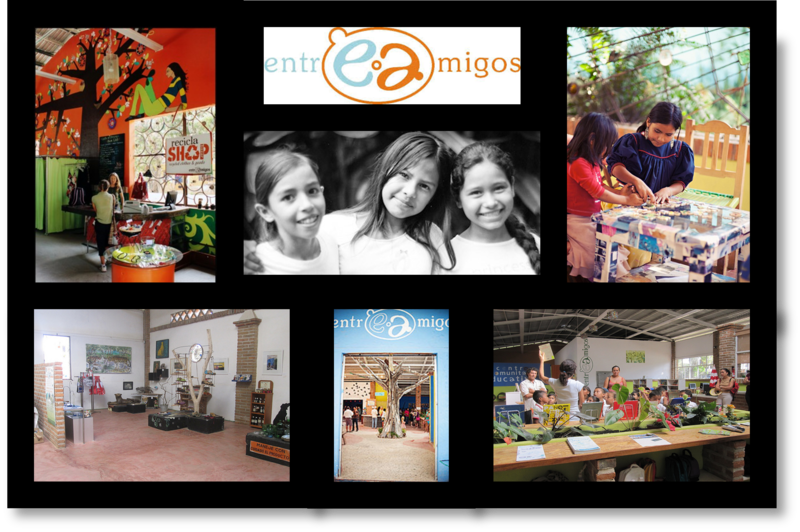 WORKSHOPS: EntreAmigos offers 100′s of classes and workshops each year. The selection of classes varies widely and depends on volunteer instructors’ skills and interests. Their Summer Workshop series brings 100′s of children together with volunteers from all over the world in a 4 week learning extravaganza. CLASSES FOR CHILDREN: The library has a constantly rotating variety of classes for children that include English, computers, reading circles and many art and recycling workshops. Most classes are free of charge and drop-ins are welcome. CLASSES FOR ADULTS: Adult classes are held in Spanish or in Spanish/English depending on the students. Classes normally offered include basic computing, English and Spanish. Cultural classes and history classes are being offered through our Spanish language program. Skill building workshops in sewing, screen printing and art are offered through the Imaginarte eco-design center. DONATIONS: EntreAmigos is funded entirely by private donations and charitable gifts. Donations are tax deductible in the United States. Charitable giving receipts are provided. To make a donation, please send a check made payable to EntreAmigos, P.O. Box 3231, Lake Arrowhead, CA 92352. If you would like to bring a few items down in your suitcase to donate to EntreAmigos, please visit the donation page of their website for a list of their current needs.